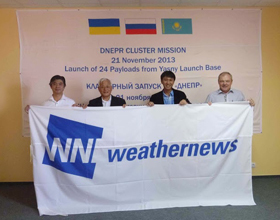 First Step into New Space Business with Successful Launch of WNISAT-1 – Weathernews Inc.
Weathernews Inc. (Chiba, Japan; RMD: Chihito Kusabiraki) has announced the successful launch of WNISAT-1 on November 21st at 16:10.11 (JST) from the Yasny Cosmodrome in Russia. 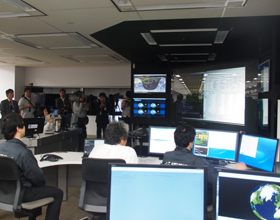 The SVOC (Space Vehicle Operation Center) mission control established at Weathernews’ Global Center has confirmed that the satellite has achieved a stable orbit, and is now in communication with ground control. This launch marks the first time that a private weather service company has put its own sensory infrastructure into space. At just 27cm3, WNISAT-1 is just large enough to fit two cameras for collecting Arctic sea ice images and two lasers to measure carbon dioxide levels in the atmosphere. The Global Ice Center at Weathernews plans to use the data from WNISAT-1 to provide a Polar Routeing service for global shipping operations in order to support efficient planning and safe voyages across the Arctic Sea. Until now, the use of space in business has mainly been confined to the sale of data from satellites. However by developing and launching a satellite as proprietary sensory infrastructure, Weathernews has taken the first step into challenging a different business model. WNISAT-1 will provide a source of data for enhanced ice monitoring and forecasting. This answers the needs of a global shipping industry still in recession, and striving to cut operating costs and environmental impact by sailing via alternative sea lanes. A voyage from Europe to Asia through the Arctic Sea is about a third of distance compared to sailing via the Suez Canal, and half the distance it takes to sail around the tip of South Africa. This not only saves time, but also voyage costs like fuel that in turn reduces carbon emissions from commercial shipping traffic. WNISAT-1 was launched into orbit last Thursday atop a Russian Dnepr-1 rocket. The Dnepr-1 is a recycled cold-war ICBM converted to carry several compact satellites like WNISAT-1 in a piggyback configuration along with a typically larger main satellite, DubaiSat-2. Shortly after the communications blackout at the base was lifted, Weathernews staff at the Kosmotras base in Domboravsky confirmed that the rocket blasted out of its launch silo safely, and all satellites had separated from the final stage in orbit a few minutes after. After confirming the success of the launch and orbital insertion of WNISAT-1, SVOC mission control at Weathernews Global Center began receiving signals from the compact cube. The signals received from WNISAT-1 have confirmed that the battery voltage and temperature are optimal, and WNISAT-1 is functioning perfectly now in sun-synchronous orbit. Starting at the beginning of 2014, the Global Ice Center at Weathernews will begin to apply the data from WNISAT-1 for Ice Routeing service during the winter season. Looking ahead to the summer when the ice melts enough to allow vessels to transit the Northern Sea Route, satellite imaging and CO2 concentration data will be used to predict and monitor ice conditions for providing Polar Routeing service to shipping companies operating voyages transiting the Arctic Sea.